Technology has changed publishing. And I’m not just talking about digital magazines or layout software or printing equipment. I’m talking about the what and why of its content. When I created a map for a magazine 15 years ago, for instance, it was extremely detailed. Every road was named, cross streets were included (at a minimum) and a detailed key was a necessity. This was the “style” because publishers expected readers to actually use the maps for navigation. I remember discussing the elements of one map with a motorcycle magazine editor. Since some riders would tear out the page (or even photocopy it) to place into the clear pocket atop their tank bags for navigation, the map’s overall dimensions had to match the tank bag while the markers and text had to be easy comprehend at a glance. Technology has changed that style, however. Today, editors expect a reader looking to follow a route will enter waypoints into their GPS. Maps have therefore become illustrations to accompany the story. They are simplified since readers are just using them for additional context as they read through article. Which brings me to a couple of maps I created for the Fall 2016 BMW Motorcycle Magazine. You can see on the Oregon map just how simplified maps have become. The route is shown intersecting various cities and places but there are no other labels or crossing highways. Even the key is distilled down to a basic state polygon with a box to show scale. 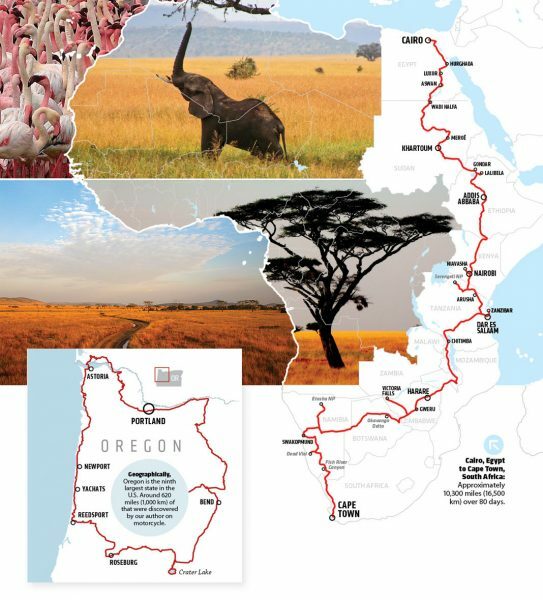 The second map takes up most of a page and shows the terrific journey along the entire length of Africa. It’s an epic odyssey and I wanted the size of the map to reflect that. Of course, the African continent is pretty large and the route from Cairo, Egypt to Cape Town, South Africa is mostly on it’s eastern edge so much of the map would be blank. Rather than waste this space, the unvisited countries were filled with images from the trip to create an interesting visual. ← How Cool Is the Art Direction on These Ads from Mercedes-Benz?